or home setting. The medical term of “noncompliance” defines a person who refuses to listen to the healthcare providers, and displays behavior that is harmful to his physical health and ultimately, to his legal claim. This article focuses on the extrinsic and intrinsic reasons why people do not cooperate with care recommendations after an injury. Extrinsic factors, which are out of the plaintiff’s control, include lack of resources. It has been our experience after reviewing hundreds of medical charts of injured patients that these individuals often get caught in a downward spiral. The inability to work may result in the loss of a job, loss of healthcare insurance, sometimes the loss of a car, and greater difficulty affording medical care, insurance premiums, or co-payments. Family members may have to become the transporters, a role that interferes with their own work and family responsibilities. 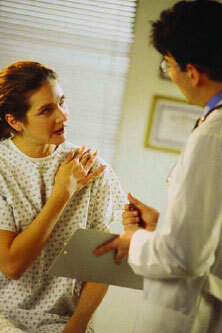 The needs of dependents may impinge on the patient’s ability to participate in the medical plan of care. Child care or elder care responsibilities, for example, may conflict with office and therapy appointments. Additionally, long waits for care at doctors’ offices or therapy centers or confusion about scheduling appointments discourage compliance with treatment. Missed appointments can set up a climate in the doctor’s office of annoyance and even hostility. Patients may be punished by judgmental and negative health care providers who are irritated by missed appointments. 1 Healthcare providers may be less than sympathetic to the injured patient who displays stress or acts out when in pain. Encountering negativity and punishment further discourage the patient from keeping appointments. In extreme cases, physicians discharge patients from their practices. This usually results when the behavior of the patient is so out of bounds as to be unacceptable. Patient behavior that may result in being ‘fired’ by the medical practice includes repeated instances of missed appointments, displays of anger, failure to follow instructions or abusive behavior towards physician or staff. Energy resources are limited by chronic pain. It is most difficult to be an optimistic participant in care for a healthier life when day-to-day stresses are overwhelming. Dysfunctional families, difficult living situations, poverty, long working hours in a tense environment, or problematic parenting issues are examples of factors that can leave injured individuals physically and emotionally exhausted. When patients face these external challenges, they simply are unable to expend either time or energy to manage complex or chronic conditions. All of this becomes a vicious cycle of despair and withdrawal from anyone who would try to intervene because even that requires their time. When they feel hopeless, they fail to return phone calls, skip medical appointments, and ignore symptoms. 3 Many medications have unpleasant side effects, discouraging adherence to a treatment regimen. Individuals who have lost their independence, role identity, and control may become depressed, resulting in lowered adherence to the treatment plan. Flares of pre-existing mental illness, such as bipolar disease, schizophrenia, or depression, may paralyze the will to participate in therapy. Pre-existing alcohol or substance abuse patterns may also worsen in the face of injury. Religious convictions may hold people back from taking advantage of ordered therapy. Some individuals take a fatalistic view of medical treatment. Cultural beliefs may conflict with the treatment regimen. Language barriers impede understanding of instructions for self-care. Faced with the experience of having pain worsened by therapy, some patients opt to not willingly place themselves in a setting where they will feel worse- at least short term. Vigorous physical therapy may cause pain to flare. Close inspection of medical records by a legal nurse consultant provides the attorney with essential information about compliance with the treatment plan. Our medical summaries include details and reasons for noncompliance. Our ability to interpret medical records encompasses the abbreviations used to record missed appointments, such as “NS” (no show), “DNKA” (did not keep appointment), and “NSNC” (no show no call). The uncommon event of a physician discharging a patient from the medical practice is invariably documented in the form of a letter to a patient. Our summaries make note of those occurrences. Plaintiff attorneys can’t afford to be uninformed about their uncooperative clients. The emotional aspects of noncompliance are more challenging to uncover and to resolve. Often, the acknowledgment that others experience these roller coaster feelings and that it is all right to be angry or depressed moves the individual closer to acceptance and active participation in care. 4 Defense attorneys can’t afford to be unaware of such patterns of behavior. Reasons for lack of cooperation need to be explored with the plaintiff, and the implications considered as part of litigation. Identifying the uncooperative plaintiff is the first step. Med League can help you with that step. 1. Husain-Gambles, M. Missed appointments in primary care: questionnaire and focus group study of health professions, British Journal of General Practice, Feb 01, 2004: 54(499), 108-113. 2. Mullahy, C. The challenge of noncompliance for case managers, The Case Manager, Volume 16, Number 2, March/April 2005.